BOB ABERNETHY, anchor: As the Jewish High Holidays begin this coming week, we note a growing movement within American Judaism that recalls the tendency in most faiths for worshippers over the years to move back and forth between the head and the heart — theology and doctrine on one side, spiritual fervor on the other. The Jewish Renewal movement is not widely known, but it is having an impact, as Kim Lawton reports. HOLLY SHERE (Praying with Group): Please forgive us our many misdeeds. Al Cheyt she’chatanu l’fanecha. KIM LAWTON: It’s just before the Jewish High Holidays, and in preparation, a small group has gathered in Silver Spring, Maryland. They are saying the traditional Al Cheyt prayer of repentance. But there’s nothing traditional about this Al Cheyt. Ms. SHERE (Praying with Group): For not composting, reusing, and recycling all that we could. Al Cheyt she’chatanu l’fanecha. LAWTON: Instead of the recited prayers led by a rabbi, these Jews are creating their own prayers of repentance and offering them while the group chants in response. Ms. SHERE (Praying with Group): For putting comfort, cost, and convenience first. Al Cheyt she’chatanu l’fanecha. LAWTON: It’s part of the Jewish Renewal movement, a popular effort that encourages Jews to ignite their individual spirituality by rediscovering the ancient practices of their faith and making those practices relevant for today. 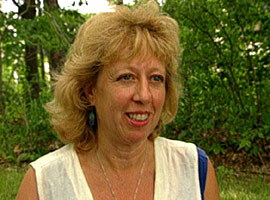 Ms. SHERE: It really has given me a doorway to a personal relationship with God. I never would have, one, really had a desire to do that. Two, I never would have thought it was Jewish at all. LAWTON: The renewal movement combines elements of Kabbalah — Jewish mysticism — with the fervor of Hasidism, the 18th-century Orthodox movement founded in Eastern Europe. Renewal participants include synagogue members from across the Jewish spectrum and secular Jews. Typically, renewal worship includes dancing, chanting, drumming, and meditation. It’s grassroots and participatory. LAWTON: The renewal movement’s spiritual leader, Rabbi Zalman Schachter-Shalomi, says the goal is a deep connection to God. Rabbi ZALMAN SCHACHTER-SHALOMI: Once you begin to speak about the longing that we have and you sing the melodies that bring the longing to the fore, and you express that in prayer, in that longing there is a response that comes from the universe. [It is] the best way in which we can say that this is God. 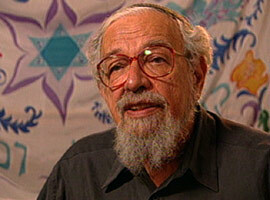 LAWTON: Polish-born Schachter-Shalomi, affectionately known as Reb Zalman, fled the Nazis and came to the U.S. in 1941. An Orthodox Hasidic rabbi, he became increasingly concerned about what he saw as a lack of spirituality in American Judaism. Rabbi SCHACHTER-SHALOMI: There are some people who after the Holocaust felt that we have to do restoration. We have to get back to where Judaism was before Hitler decimated 6 million. And it was such a deep cut, as it were, of vital power and energy of our people. LAWTON: Trying to restore that energy, Reb Zalman taught that in addition to working to repair the world through social justice, Jews should work to repair their own hearts. In 1976, he founded ALEPH, the Alliance for Jewish Renewal. Today ALEPH has 40 affiliated communities around the world. At renewal conferences and retreats, participants engage in Jewish rituals and study the meanings behind them. They are also encouraged to create their own spiritual expressions. 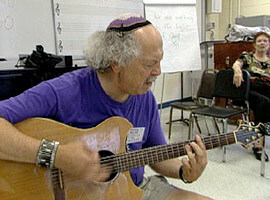 They incorporate elements from other traditions such as reggae and gospel, and even a Jewish version of yoga. Rabbi DANIEL SIEGEL (Alliance for Jewish Renewal, ALEPH): We may borrow a form from another tradition; they may borrow a form from us. But the essential experience is something that each of us gets to in our own way. LAWTON: Reb Zalman says different faiths have much to teach each other. In 1990, he traveled to Dharamsala, India for dialogue with the Dalai Lama. The trip became the subject of the book THE JEW IN THE LOTUS. Rabbi SCHACHTER-SHALOMI: We work in different spaces, but it doesn’t mean that we do different work. We each want to preserve as much of the ethnic and traditional material that we can, but to transform it so that it can be practiced in the present. LAWTON: The movement is having a growing impact. Renewal practices are now used in synagogues across Jewish denominations. Renewal has also attracted many disaffected Jews, especially those who were exploring Eastern religions. Professor Neil Gillman has studied the renewal movement. He says its popularity is a reaction to a Judaism that overemphasizes the intellectual. LAWTON: That was the case for Rabbi Shefa Gold. Rabbi SHEFA GOLD (Center for Devotional Energy & Ecstatic Practice): One of the reasons why I left the synagogue — it was so hard for me to be in the synagogue — is because when I began to pray I wanted to move my body, and I wanted to feel my emotions and bring all of myself to it, and it felt as if I could just be there from the head up. LAWTON: Gold says she experimented with several other spiritual paths before renewal brought her back into Judaism. She now writes hundreds of chants that are used in services around the world. Renewal is also providing a spiritual home for people like Judy Barokas, who was raised Orthodox but says she wants to stay on the secular side of Judaism. JUDY BAROKAS: Jewish Renewal is very low on dogma, and people come to it from all angles. The expression of joy through drumming, through music, through chanting — I think there are parts of the brain that are only touched by communal expression of joyful sound, and that touches my heart and touches my head and touches the rest of me so that that’s where I find religious expression. LAWTON: But it’s not for everyone. Many dislike the free-form style of worship. Others worry that renewal’s all-inclusive approach may water down Judaism. And Professor Gillman says some Jews raise concerns that the movement emphasizes spiritual experience over observing Jewish law. LAWTON: Renewal leaders shrug off such criticisms. Rabbi SIEGEL: It’s always our intention to augment and enhance existing practice. We are not in the business of trying to replace anyone. And I think over time people are beginning to realize that that’s actually true of us and slowly but surely, people are becoming more accepting and more open to what we offer. Rabbi SCHACHTER-SHALOMI: I feel that as long as I can connect people in a loving direction with God, the rest is up to God. LAWTON: They believe the movement will revitalize Jewish worship and bring Jews back to the faith. 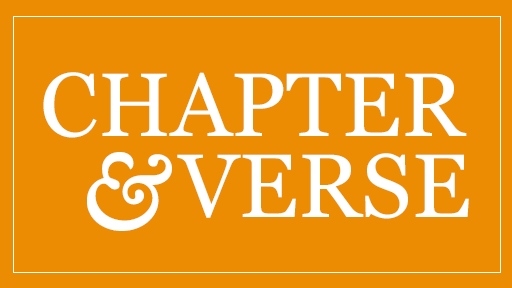 Read more of the R & E interviews about Jewish Renewal with Rabbi Zalman Schachter-Shalomi and Professor Neil Gillman.